By Jim Dower: Dillian ‘The Body Snatcher’ Whyte (23-1, 17 KOs) says he wants to set himself up for life by knocking out former WBO heavyweight champion Joseph Parker (24-1, 18 KOs) in their headlining fight this Saturday night on Sky Box Office at the O2 Arena in London, England, and then use the win to get a huge money rematch against IBF, WBA, WBO champion Anthony Joshua on April 13. Whyte wants to take the fight against Joshua at Wembley Stadium to make the big money that has been thus far elusive to him in his seven-year pro career. 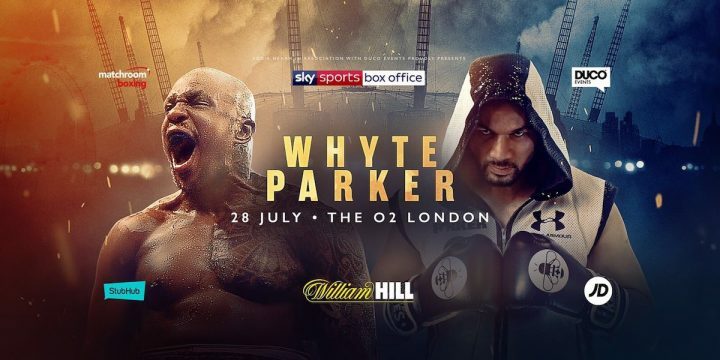 Whyte, 30, realizes that Parker is the best opponent since his 7th round knockout loss to Anthony Joshua in 2015, and he would like to beat him in such a manner that sends shockwaves through the heavyweight division. Parker and Whyte have both been beaten by Anthony Joshua in the past. Parker says he wants to beat Whyte in a more impressive manner than Joshua did by stopping him inside seven rounds. Whyte would like to knockout Parker to improve his chances of getting the Joshua rematch. A highlight reel knockout for Whyte could increase his chances of facing Joshua on April 13 if Deontay Wilder doesn’t agree to the $15 million flat fee offer from Joshua’s promoter Eddie Hearn for that fight. Despite not being a huge puncher, Whyte, 30, says he’s going to inflict pain on the younger, faster and stronger Parker and knock him out. However, for Whyte to KO Parker, he’s going to either land the perfect shot or else him stand immobile like a punching bag for the duration of the fight. Whyte’s last opponent was against Lucas ‘Big Daddy’ Browne, who resembled a heavy bag with arms with the way he stood in front of Whyte and took shots for six rounds until the fight was halted in the 6th. The winner of this fight could find himself facing Anthony Joshua on April 13 fight. Promoter Eddie Hearn says Anthony Joshua wants Whyte to face him on April 13. If Hearn is able to make the Joshua vs. Deontay Wilder fight, then the winner of the Parker vs. Whyte scrap will need to wait for the smoke to clear from that fight. Deontay Wilder stands to gain nothing from fighting Parker or Whyte if he gets past Joshua. It’s in Whyte’s best interest to make the boldest predictions he can, as it’ll help bring in pay-per-view buys on Sky Box Office, and that in turn will help his bottom line. But if Whyte is seriously thinking of trying to knockout Parker, he might be barking up the wrong tree because he doesn’t possess that type of power for him to knockout a younger fighter with talent. The fighters that Whyte has knocked out in the past have been flawed guys with little talent. Whyte has never knocked out anyone that you can call a good fighter. Whyte’s stoppages have typically come against C-level fighters. When facing guys with a shred of talent, Whyte has been forced to go the full 12 round distance. Matchroom Boxing. The sold out crowd is likely going to be over 90% cheering for Whyte. The only thing Whyte needs to do is make sure the fight goes the full 12 rounds for him to have a very good chance of winning a decision. Parker is the one with all the pressure on him. He needs a knockout to make sure he doesn’t wind up losing the fight, and it’s not going to be easy for him to get the stoppage due to Whyte’s strong chin. Parker has never been a strong pressure fighter during his career. The knockouts that Parker has scored have been a case where his power was too much for his opponents to handle. Parker rarely has gone after his opponents to look for a quick knockout. Parker has never knocked out a high caliber heavyweight contender during his career. His best knockouts to date have been against these fighters: Alexander Dimitrenko, Kali Meehan, Bowie Tupou, Yakup Saglam, Brian Minto and Solomon Haumono. Those are not top tier heavyweights. Parker failed to knockout his best opponents – Andy Ruiz Jr., Anthony Joshua, Carlos Takam, Hughie Fury and Razvan Cojanu. For Parker to stop Whyte, he’s going to need to cange the way that he fights by coming forward and applying massive pressure. Parker won’t be able to stop Whyte by bouncing in and out of range like he did in his fights against Carlos Takam and Joshua. With the lack of a quality undercard for this Saturday’s Whyte-Parker fight, it’s not likely to do well on Sky Box Office. Parker and Anthony Joshua made it dull for boxing fans for their March 31 fight on Sky Box Office PPV at the Principality Stadium in Cardiff, Wales. Over 70,000 boxing fans showed up to see the Joshua-Parker fight live, and it turned out to be a real disappointment. Joshua seemed to be trying to copy Wladimir Klitschko with his fighting style, and Parker was prevented from fighting on the inside due to an over involved referee. The fans will likely not have forgotten that boring fight, which is why this Saturday’s Whyte vs. Parker fight may turn out to be a disaster in terms of PPV buys. The fight sold out the O2 Arena, but that doesn’t mean that it’ll bring in good numbers on Sky Box Office. It’s obvious that Parker is the best opponent for Whyte since his fight with Joshua in 2015. Whyte’s best opponents since that loss are Dereck Chisora, Robert Helenius, and Lucas Browne. Those guys are all fringe level heavyweights, and not top five contenders. Parker is a top five contender, and Whyte will find that out soon enough when he gets inside the ring with him on Saturday night. Whyte will need to raise his game from the plodding performance he did in beating the above mentioned fighters. He looked slow and weak in those fights, and not the big puncher he would need to be for him to get Parker out of there. Parker wants to go after a knockout in this fight. He knows he needs to make a statement in beating Whyte and the best way to do that is to knockout the second best heavyweight in the UK. « Mikey Garcia fights Robert Easter Jr. on Sat.